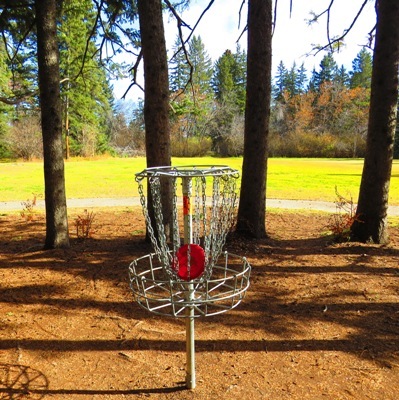 Disc Golf is played much like regular golf, but instead of trying to hit a ball into a hole, players attempt to get discs into a basket in the least amount of throws. Similar to clubs in ball golf, there are different discs for each shot. There are hundreds of discs available on the market which generally fall into three categories: drivers; midranges and putters. It is recommended that you have one of each to start although one could get away with just a midrange (such as a 'Buzz') in the beginning. Frisbees are usually not suitable as they do not fly far enough but they'll suffice if you just want to give the game a try. Baker Park is a great 18 hole course in a beautiful maintained park. Par is 56 over the full course. Holes vary in length from around 200ft to a little over 500ft. It is challenging but not too overwhelming as a course. Beginners are welcome but basic throwing skills are helpful in getting the most out of the game. If you participate in sports such as softball or ltimate frisbee, you should pick the game fairly easily. Games are pretty casual and scorekeeping is optional. The goal here is to simply have fun while enjoying the great outdoors. Everyone should bring their own discs but if you're a first timer who just wants to give it a try before investing in any equipment, we usually have a few extra discs on hand to lend out. Event Directions: Baker Park sits directly across the river from Bowness Park. It can be accessed via 85 St NW. -From Stoney Trail: Turn onto Nose Hill Drive and exit at 87 ST NW, then turn onto Bearspaw Dam Rd eastbound for a bit and then turn onto 85 St NW southbound. Exit onto Scenic Bow Rd and follow it for a few blocks (3rd left) to the main parking area. From the west end of the parking lot, briefly head west along the pathway then turn south (left) towards the river at the first intersection. You will arrive at the first tee within 1 minute. -From Bowness Rd NW: Continue onto 85 St NW and exit right onto Scenic Bow Rd (Al Azar/Shriners exit)and proceed under the bridge. Keep left at the fork and take the third left into the main parking area. From the west end of the parking lot, briefly head west along the pathway then turn south (left) towards the river at the first intersection. You will arrive at the first tee within 1 minute. Recommended investment in Disc Golf Discs are a putter, midrange and driver.